Columbus, Ohio, March 11th, 2013 ‘€“ DOmedia, the most comprehensive database and toolset for advertising media, announced that it has been chosen by AlwaysOn as one of the OnMedia Top 100 winners. Inclusion in the OnMedia 100 signifies leadership amongst its peers and game-changing approaches and technologies that are likely to disrupt existing markets and entrenched players. DOmedia was specially selected by the AlwaysOn editorial team and industry experts spanning the globe based on a set of five criteria: innovation, market potential, commercialization, stakeholder value, and media buzz. DOmedia and the OnMedia Top 100 Companies will be honored at AlwaysOn’s OnMedia NYC event on March 18th, 2013, at Convene (formerly Sentry Centers) in New York City. The OnMedia 100 winners were selected from among hundreds of other technology companies nominated by investors, bankers, journalists, and industry insiders. The AlwaysOn editorial team conducted a rigorous three-month selection process to finalize the 2013 list. DOmedia’s RFP application help users do media better. Become faster ‘€“ save time and cost through the media buying process; smarter ‘€“ manage data and analytics to gain a historical knowledge; and better ‘€“ grow revenues and profits for your business. Through our online marketplace, media providers create enhanced media profiles for their properties. In turn, advertisers & agencies can use our extensive & comprehensive database of media properties to find new ideas, plan & even build the perfect out-of-home campaign. AlwaysOn is the leading business media brand networking the Global Silicon Valley. AlwaysOn helped ignite the social media revolution in early 2003 when it launched the AlwaysOn network. In 2004, it became the first media brand to socially network its online readers and event attendees. AlwaysOn’s preeminent executive event series includes the Silicon Valley Innovation Summit, OnMedia, OnHollywood, IMPACT Venture Summit Mid-Atlantic, Venture Summit East, OnDemand, Venture Summit Silicon Valley, OnMobile, AlwaysOn Australia, and GoingGreen Silicon Valley. The AlwaysOn network and live event series continue to lead the industry by empowering its readers, event participants, sponsors, and advertisers like no other media brand. 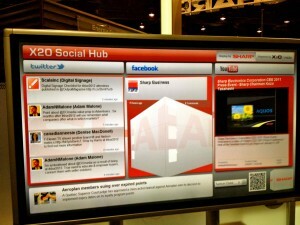 The Digital Signage Twitterverse was abuzz at DSE 2012. 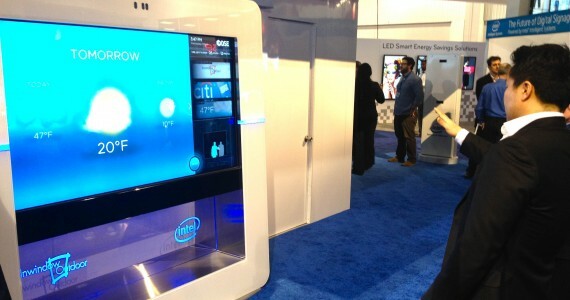 Although tweet-volume was down a bit from last year, the explosion of integrated screens on the show floor made for a rich social experience for attendees and exhibitors. It seemed like every booth had a live-stream. 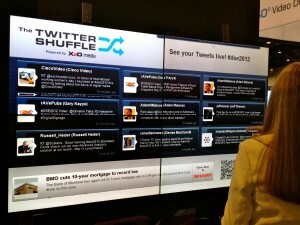 During one 5 minute span I was able to immortalize my twitter handle on a half-dozen unique displays. Personal vanity aside (for a moment!).. this is a clear signal that network operators, software, and content-providers are recognizing and harnessing the power of social.